Go Metro and Save 50% off Initial Comprehensive Dental Exam* and Receive Free Validated Parking**! For over 30 years, Little Tokyo Dental Group has built strong, healthy smiles for families from across the Los Angeles area and beyond. Our dedication to excellent clinical care and commitment to outstanding patient service translate into an exceptional dental experience. A standard of excellence in personalized dental care enables us to provide the quality dental service our patients deserve. Show your valid TAP card, Metro employee ID, or LA County employee ID to save 50% off an initial comprehensive dental exam with full set of x-rays for new patients and receive free parking validation at Joe’s Auto Parks (350 E. 2nd St.). 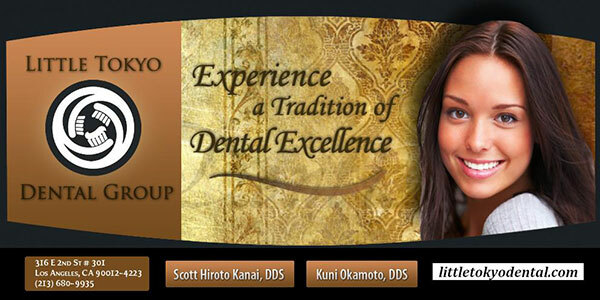 Little Tokyo Dental Group is located at 316 E. 2nd St in Downtown Los Angeles. Take the Metro Gold Line and exit Little Tokyo/Arts District Station. *Initial comprehensive dental exam for new patients only. Must present coupon to redeem offer. Coupon available at www.littletokyodental.com. **Parking validation valid only with Joe’s Auto Park (350 E. 2nd St.).